Entry: £8 per class on the day. • Class 1: TURNOUT. Open to all. Judged equally on handler, tack, horse/pony and overall impression. • Class 2: CONDITION. Open to all. Judged on the condition of horse/pony according to age, type etc. • Class 3: SENIOR HANDLER. Handlers 16yrs+ Special award for the oldest combination. • Class 4: JUNIOR HANDLER. Handlers 5–15yrs. Special award for the youngest handler. • Class 5: VETERAN HORSE OR PONY. 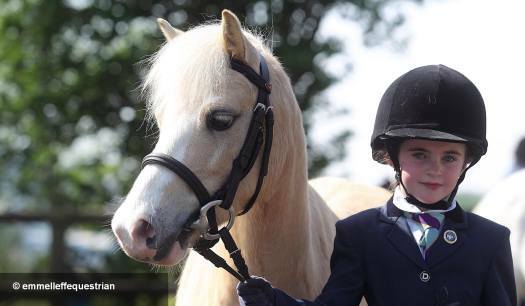 For ponies and horses of any breed, exceeding 15yrs old. Highland, New Forest, Shetland, Welsh A, B, C & D. Stallion, mare, colt, filly or gelding, any age. This class may be divided as appropriate. Class 8: BSPA / EQUIFEST IN HAND PIEBALD/SKEWBALD. Open in-hand piebald/ skewbald stallion, mare, colt, filly or gelding, any age. The first three places will also qualify for the BSPA championships. Subject to their show rules and conditions. This class may be divided according to entry. • Class 9: YOUNGSTOCK. Any breed foals to 3yrs. • Class 10 : SHETLANDS and MINIATURES. Any age, not to exceed 42ins at maturity. In Hand Championships will follow Class 10. • Class 11: TACK AND TURNOUT. Open. Judged equally on rider, horse/pony, tack and overall impression. • Class 12: LEAD REIN AND FIRST RIDDEN. Riders 11yrs and under. All ponies must be ridden in a snaffle bridle and have lead reins attached to the noseband. This class will be divided if sufficient entries. EQUIFEST OPEN RIDDEN MOUNTAIN AND MOORLAND Open to all Mountain and Moorland ponies registered with their respective Pure Breed Societies of Connemara, Dales, Dartmoor, Exmoor, Fell, Highland, New Forest, Shetland, Welsh A,B,C & D. Stallion, mare, or gelding, 4 years old and over. Rider any age. This class may be divided as appropriate. • Class 13: Small breeds. Shetland, Welsh A and B, Exmoor and Dartmoor. • Class 14: Large breeds. Fell, Dales, Highland, Welsh C and D, and New Forest. • Class 15: RIDDEN HORSE OVER 14.2hh. • Class 16: RIDDEN PONY UP TO 14.2hh. • Class 17: RIDDEN VETERAN HORSE OR PONY of any breed, exceeding 15yrs old. • Class 20: BSPA/EQUIFEST RIDDEN PIEBALD/SKEWBALD. Open ridden Piebald/Skewbald stallion, mare or gelding, 4 years old and over. Rider any age. The first three places will also qualify for the BSPA Championship. Subject to their show rules and conditions. Classes May be divided according to entries. • Class 21: FAMILY PONY. Any breed. to be ridden by one junior and one senior. Junior can be lead. Ridden Championship will follow Class 21. WORKING HUNTER RING from 1.30pm. • Class 22 Novice. Open to any combination never placed in any WH class previously. Jumps not to exceed 40cm. Riders may be led or accompanied. • Class 23 Working Hunter Pony not exceeding 14.2hh. Jumps not exceeding 60cm. • Class 24 Mountain and Moorland Working Hunter. Any native breed. Jumps not to exceed 70cm. Working Hunter Championship follows Class 25. 1. Competitors ride at their own risk. We will not be held responsible for any damage to any equine, property, or person at this show. 3. Please remove all litter and droppings from the show field. 4. Ridden horses and ponies must be a minimum of 4 years old. 5. Anyone obviously too heavy for their horse or pony or found abusing any horse or pony will be asked to leave. 6. Please keep dogs on leads and away from the show rings. 7. All riders must be suitably dressed and wear a standard riding hat (Marked PAS015) with chin strap done up at all times whilst mounted. Also applies to HANDLERS under 18yrs. 8. Stallions should be handled or ridden by 14yrs plus and be bitted. 9. Due to Hygiene precautions, please bring your own water and containers. The Judges’ decision is final in all matters. Passports may be requested. Medals to third place, rosettes to sixth in all classes. Sashes to Champion and Reserve in the In Hand, Ridden and Working Hunter Sections. For more information contact us on Facebook or ring 01754 830316. This entry was posted on April 6, 2019	and is filed under Events. You can follow any responses to this entry through the RSS 2.0 feed. Both comments and pings are currently closed.